This meeting of educators and administrators from the Metro Vancouver region will bring together leaders to help vision and plan for our Metro Vancouver Leadership events and initiatives in 2019. Please visit our website or contact us at info@c2c-bc.org for more details. Contact Jonathan Dyck for more details. Please note that we are not taking a waiting list. However, we invite you to click here to register your interest in attending the EECOM 2019 Conference – May 10-12, 2019. Those who register their interest will be given one week’s advance notice of the conference so they can secure their spot before general registration opens. Confirmed Partners and Presenters can click here to register. As always please bring along any fellow educators and/or outdoor enthusiasts interested in joining us, the more the merrier. BC curriculum is changing. School districts and teachers are working hard to transform along with it. 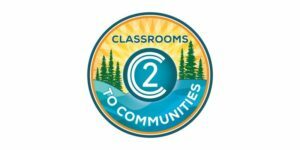 The Metro Vancouver Classrooms to Communities (C2C) Leadership Clinic is an immersive professional development opportunity for school district teams to advance community connected learning as a priority school district action strategy. What’s in it for your school district / team? This innovative MEd cohort program will engage participants in real-world projects enmeshed in questions of learning and scholarship. This partnership program features an Adaptive Education model, which builds a pedagogical bridge that ties the project and classroom to the community. Participants will consult on, experiment with, and co-create solutions that address problems which come to light in the course of working with the City of Vancouver on sustainability priorities. The Columbia Basin Environmental Education Network (CBEEN) is hosting a Climate Change Education Workshop for educators from across the Columbia Basin. 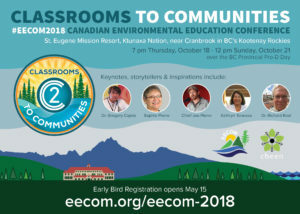 This will take place in Nelson on Saturday, March 3 and is just $20 for CBEEN members ($40 for non-members) and includes climate change education resources, a morning workshop by Columbia Basin Trust’s Climate Action Program, a national resource round-table over lunch with organizations like Green Teacher, Let’s Talk Energy and Green Learning Canada, and the BCTF ‘Climate Heroes’ workshop in the afternoon. Join EEPSA and many others at the annual New Teacher’s Conference. In this teacher Pro-D workshop, learn how to grow an ecologically-friendly school food garden by fostering relationships between soil, plants and animals. Register and learn. Join EEPSA and other community educators in the winter solstice celebration event. Share your ideas on key ingredients that lead to success within growing our communities. In partnership with EEPSA, Science World, Classrooms to Communities, Metro Vancouver, and HCTF. School district staff and community educators are invited to participate in the pilot ‘Classrooms to Communities’ Curriculum Implementation Workshop which will take place in 3 weeks at JL Crowe Secondary School in Trail on Monday, November 27. This is an opportunity for teachers and community educators to come together to learn, share, connect and collaborate to support Place-based Learning within the context of the redesigned curriculum. Registration opens middle of April. Get notified of when you can register. Register early for the best rates! Two full days overflowing with interactive, inspirational and highly applicable professional learning opportunities created by 25 BC PSAs. Over 30 remarkable keynote presentations on big ideas from every subject area, brain research, digital literacy, inclusion, and more. Your choice from hundreds of sessions offered in a variety of formats, including lectures and hands-on learning opportunities presented at Vancouver Convention Centre East, Pan Pacific Vancouver, Telus World of Science, and Stanley Park Ecology Society. Access to a massive Exhibitors Hall featuring the latest educational products and services. Unlimited networking opportunities with nearly 6,000 BC educators and education. Optional one-year membership to the PSA of your choice (additional charge). The Master of Museum Education (MED5) program starting September 2018 (application deadline is March 2018) is having an online information session on Thursday, September 28, 4pm-5:30pm (PDT). The MED5 is a part-time, blended cohort graduate program open to domestic and international students – it is delivered 90% online. Focusing on the study of education and learning that occurs in museums and other informal learning context, the programs draws together museum professionals and educators, and those with an interest in using the community to support teaching and learning to further their thinking and scholarship around museums as sites of education and learning. If you are interested in the MED5 program and would like to learn more, please RSVP to the online info session, which will be held using the BlueJeans conferencing system. Please register because space is limited.